This imposing estate in the Nibenese style was originally built as the summer manor of an Imperial City nobleman, now sadly deceased. Gardens with statues and a reflecting pool surround the stately walled mansion. Sumptuous! Linchal Grand Manor is a player manor to the northeast in the Gold Coast. It was only available from the Crown Store for a limited time. 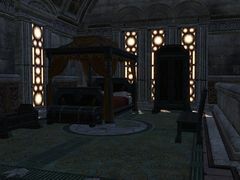 Once belonging to a now deceased nobleman from the Imperial City, this Nibenese resort could be purchased by the player. The courtyard boasts a large assemblage of hedges and shrubbery, with pillars, posts, and statues of an Imperial Nibenese style. Situated in the center of the courtyard is a reflecting pool. 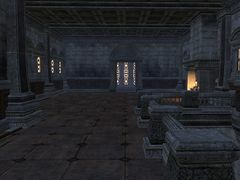 A tholos stands in the eastern side of the courtyard, with the western side consisting of a rather barren barn. The actual manor house is located on a terrace, up the steps to the north, surrounded by ground that is mostly paved in stone slabs. Also accessible from the courtyard are two towers; the southeast and southwest towers, with doors positioned on either side of the gate. 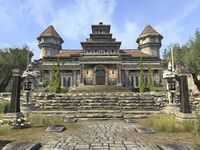 Both entrances lead through to trapdoors on the rampart, providing an overlooking view of Kvatch and Marja's Mill. 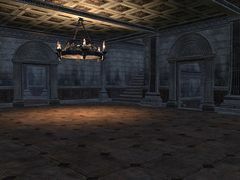 Through the porch entrance to the manor interior is a large foyer, lit by two chandeliers (or just the one chandelier, if the unfurnished version of the player house was purchased), and decorated with an impressive array of carpets and rugs. Aside from that, there are some basic furniture pieces, such as tables, chairs, and sideboards. The eastern room is the bedchamber, featuring a canopy bed, a cradle, a mirror with dividers, and some typical parlor furnishings. 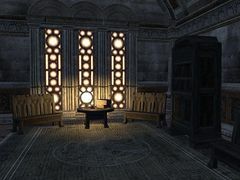 Across the hall, to the western room, is the study which is mainly fitted with a desk, two cabinets, and some sitting furniture, all illuminated by the lit logs on the fireplace (which are also featured in the unfurnished version of the player house). 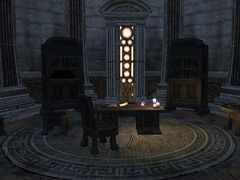 Also, there are two copies of Cheeses of Tamriel in this room, one laid on the desk, and the other on the nearby nightstand. 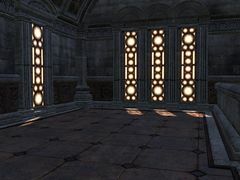 The final room on the first floor is to the north of the entrance, and appears to be used as an office, lit only by a set of candles on the desk in the center of the small room, and the dim light that shines through the thin, yet tall, windows. Filled with plenty of sitting furniture, there is a coffer atop a small round table, and a collection of paintings positioned on either side of the entryway. Upstairs, to the second floor, is an open-plan dining area primarily occupied with a counter, cupboards, and tables. 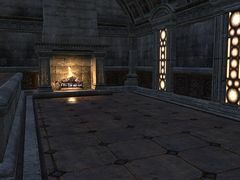 The ashen logs (or the flaming logs, if the unfurnished version of the player house was purchased) on the hearth provide little light in comparison to the abundance of windows. To the far end of the second floor is a small lounge, consisting of some pews, a cabinet, a set of drawers, and a stack of books atop a candlelit table. The lounge room also has a door to the west balcony, while the dining area has a door to the east balcony. 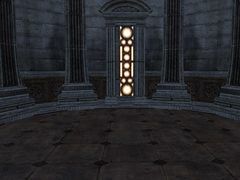 Note that both these doors lead to one singular balcony, which offers a view of the whole courtyard. 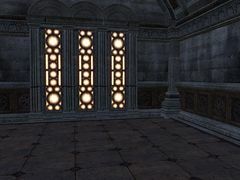 Although, it is empty in regards to furnishings, it does provide a good opportunity to those feeling decorative to freely customize this part of the player house. 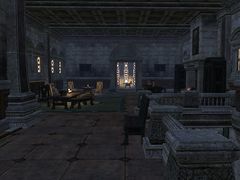 The Linchal Grand Manor was only added into the game after Update 15, before that the site of the house was part of the rocks and trees that help form the natural boundaries surrounding the Gold Coast. 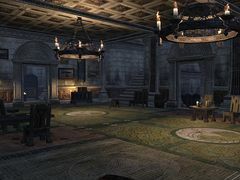 Despite being located in the Gold Coast, the Linchal Grand Manor can be accessed without owning the Dark Brotherhood DLC. 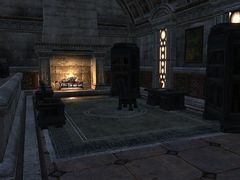 The manor itself is a reuse of the Gold Coast Trading Company in Anvil and The Shining Star in the Hollow City. 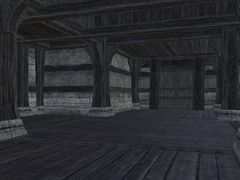 The barn is the Nibenese style building seen at the docks in Anvil. From the courtyard towers, the rampart parapet can be jumped over (facing the southern direction), and while you cannot fall out of the local area, you will instead find yourself standing on an invisible boundary which has its collision enabled. This page was last modified on 13 February 2019, at 01:36.